The finalists in Next Landmark 2014, the architecture contest held by Floornature, include ASA studio’s Early Childhood Development & Family Centers. ASA or active social architecture designed and built Early Childhood Development & Family Centers sponsored by UNICEF in 9 districts of Rwanda. The first two centres were built by the local people under ASA studio’s guidance. UNICEF constructed the Early Childhood Development & Family Centers to address the issue of education in poor areas where there were limited prospects for children's development in Rwanda. ASA studio’s project is among the finalists in the Next Landmark 2014 international architecture contest, in the Next Landmark of the Year category. ASA, which stands for Active Social Architecture, is an architectural practice based in Kigali which was appointed by UNICEF to come up with a series of children’s centres featuring spaces, forms of construction and flexibility that could be repeated in Rwanda’s 9 administrative districts. As the architects themselves report, different sites in Rwanda vary not only topographically but in social significance. For the sociocultural project for the new UNICEF children’s centres to be accepted by the people of Rwanda, the geographic locations had to be chosen carefully, choosing central places which are clearly visible and considered safe by the children’s families. The two prototypes of the nine Early Childhood Development & Family Centers built so far have deep local roots: APA’s plan for the series of centres leaves behind the rigidity of the standard scheme imagined on paper and allows itself to be transformed by specific needs. The architects consulted the people in each place through the voices of the community, of the people, who described their needs and their ideas about education. As the buildings took shape over time, they came to be the very heart of their communities. In this project ASA studio applied experience gained in other projects for UNICEF, for local communities or in collaboration with other architects such as TAM associati who work in difficult places as in Africa. It was essential to establish a relationship of trust and dialogue with local craftspeople. 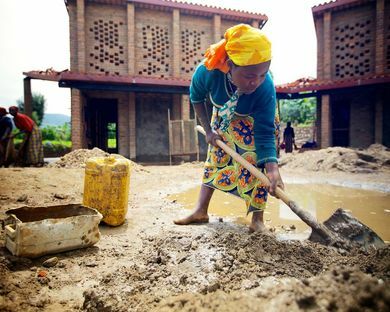 The Early Childhood Development & Family Centers were built using local construction techniques and materials, such as the bricks used in the structure; use of cement was avoided because the material is very expensive in Rwanda, where it has to be imported. The project reinterpreted the traditional model of the ’”urugo”, a school building based on the element of the central space, a courtyard with building units facing onto it, organised on the basis of different layouts to suit the case at hand. The classroom modules are on one or two levels, with numerous windows and openings in the façades to improve ventilation and establish a visual relationship between the people using the spaces and those outside in the courtyard and on the land around the building. The decision to build separate architectural modules sharing the same arcade creates a harmonious alternation of full and empty volumes through which people can see the landscape around them, making it a part of their daily lives. The project not only submits to nature but makes attentive use of it: underground is a big reservoir for collecting rainwater with which to water the gardens around the centre.